attention to detail and feeling of speed. 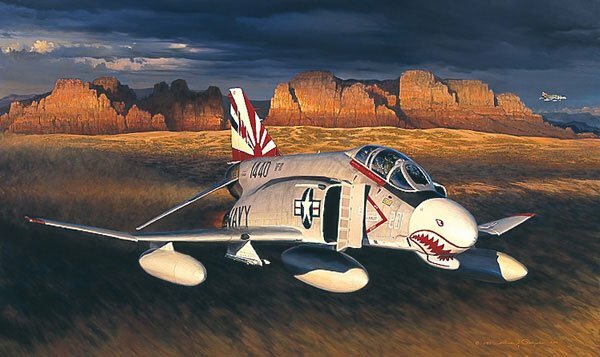 In this painting, a F-4N of Navy squadron VF-111, as it looked in 1976, sporting red, white and blue tailmarkings to celebrate the bicentennial, moves down close and fast across the northeastern Arizona desert. When VF-111 was established during the World War II, it adopted the emblem of a setting sun and during the late 1960s and throughout the 70s, the squadron had some of the most colorfully painted aircraft in the Navy. "Sierra Hotel" are frequently used aviation code words meaning "all is going well.